January brought several negative developments for 3D Systems investors. What: The 3D printing sector continued its losing streak in January. 3D Systems (NYSE:DDD) fell more than 18%, faring significantly worse than the S&P 500. Archrival Stratasys (NASDAQ:SSYS) fell more than 33%. So what: January brought several negative developments for 3D Systems investors. For starters, the broader market has been selling off and had its worst start to a year in stock market history. Investors have grown increasingly concerned that China -- a major player in the global economy -- may experience a hard landing, meaning growth may slow more dramatically than expected. Considering China represents a large industrial base, which is a major source of business for many of 3D Systems' largest industrial customers, a hard landing could indirectly affect 3D Systems' business. Second, numerous Wall Street analysts -- including Canaccord, UBS, and Jefferies -- downgraded their price targets or outlooks on 3D Systems. This reflects a growing consensus of uncertainty among Wall Street pros toward the company's nearer-term prospects. Third, 3D Systems and Stratasys have both experienced a notable slowdown in customer spending through the first nine months of 2015, which significantly affected their 3D printing hardware sales. Stratasys believes that the industry expanded too quickly and created an oversupply of capacity in the marketplace. Stratasys' management noted that customers may be opting to use up their overcapacity capacity instead of purchasing additional 3D printers. Reasoning aside, this slowdown has undermined the razor-and-blade aspect of 3D Systems' investment thesis, where 3D printer sales fuel the long-term sales of high-margin consumables and drive longer-term profitability. Ultimately, if 3D Systems doesn't begin to grow its installed base at a healthier pace, it could become a major problem. 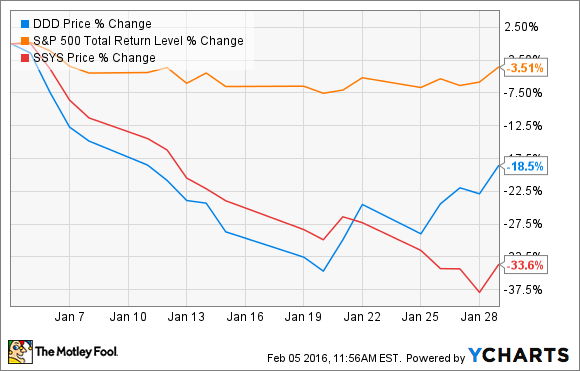 Now what: As of Feb. 5, 3D Systems' stock recouped nearly all of its January losses. This short-term volatility isn't likely to change until investors get a better understanding of where 3D Systems' business is heading in the future. Beyond dealing with what appears to be a prolonged slowdown in demand, 3D Systems has to find a new CEO, improve its operational efficiency that's been weighed down by an overly aggressive acquisition strategy, and remain differentiated in an increasingly competitive marketplace. In other words, there's uncertainty facing 3D Systems internally and externally. How management navigates these challenges should become a major focus for investors.